The 2017 Prius Prime looks good, delivers 25 miles of electric range and in hybrid mode gets 54 mpg in combined city/highway driving. Toyota hit an uncharacteristic blooper with its last plug-in hybrid Prius, but it well may have a home run with the new 54 mpg, 2017 Prius Prime plug-in. You’ll read a lot about the Prime’s improved 25 miles of EV range, more than double that of its predecessor, the massive 11.6-inch touchscreen control panel in the top trim levels and the new nose and tail treatments that make the Prime so much better-looking than the recently redesigned standard Prius. But the big story for most shoppers is that buyers qualifying for the maximum federal tax credit of $4,500 will pay about $2,400 less for the entry-level plug-in 2017 Prius Prime than for the base standard hybrid Prius. In fact, in any trim level the Prime will cost less after incentives than will the comparably equipped model of the standard hybrid Prius, which doesn’t benefit from a federal incentive. That means Prius Prime buyers get up to 25 miles of electric range, a potentially vast increase in fuel efficiency -depending on how much all-electric driving you do- plus improved handling (although it is still pokey from 0-40 mph) and better looks, all for less money. The sacrifices are minimal. 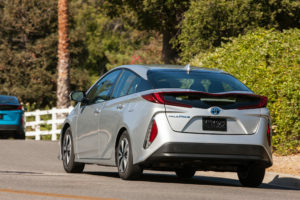 The Prime is a four seater while the standard Prius has five seats, and in order to make room for its larger, grid-chargeable battery, the Prime’s 19.8-cubic feet of rear cargo area is about 15 percent smaller the in the standard hybrid model. That’s still almost double the cargo space offered by the 2017 Chevy Volt, which figures to be the Prime’s biggest competition. The Prime is a roomy plug-in hybrid (PHEV) compact that offers all the practicality, efficiency, engineering finesse and safety, comfort and convenience features we’ve come to expect from Toyota vehicles. TheGreenCarGuy verdict? The 2017 Prius Prime may well do for plug-in hybrids what the original Prius did for regular hybrids: Make them popular. The Prius Prime, which goes on sale in late November, comes in three trim levels: Plus, $27,965; Premium, $29,465; Advanced, $33,965. Prices include destination charges but are before any incentives. 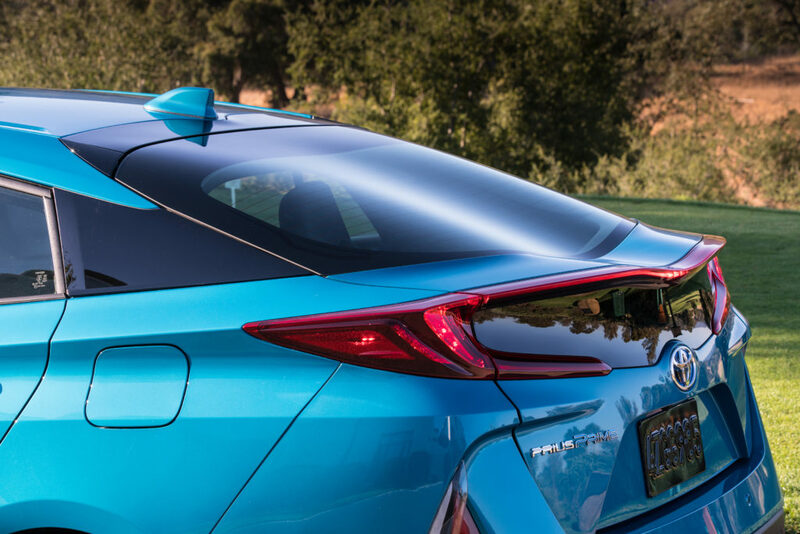 A curved rear spoiler and matching “wave-form” rear glass highlight the view of the 2017 Prius Prime most following motorists will see. Other than exterior paint and interior trim colors, there are no options for any trim level. The 2017 Prius Prime is eligible for a federal tax credit of up to $4,500. That makes the Prime, in all three trim levels, less costly than the comparably equipped standard hybrid Prius. Toyota also is giving buyers a $100 credit toward charging fees when using commercial public chargers in the ChargePoint network. Various state and local governments and public utilities also offer plug-in hybrid and battery-electric vehicle owners incentives that can range from cash rebates and state tax credits to non-cash perks such as free parking and single occupancy use of carpool lanes. Check here to see what’s available in your state. Toyota says the Prius Prime will receive EPA ratings that put it at the top of the plug-in hybrid segment – 55 mpg for the city cycle, 53 mpg for highway driving and 54 mpg combined. With a full charge and a full 11.3-gallon tank of gasoline, range is estimated at 640 miles. The combined rating is 10 percent better than the discontinued 2015 plug-in model’s and, as with the Prime’s EV efficiency, a segment-leading performance. Overall efficiency in EV mode, which is largely electric but can include some gasoline power, is rated at 133 MPG-e. That’s a 40-percent increase over the previous Prius plug-in and makes the Prime, for its short span of all-electric travel, the most efficient electrified vehicle in the market. The Prime’s ratings compare to 52 mpg overall for the five trim levels of the standard Prius liftback and 56 mpg for the Prius Eco model. The standard hybrids, however, don’t benefit from the efficiency-extending EV range of the Prime PHEV, which is programmed to use all-electric power every chance it gets. Those who do a lot of relatively short (less than 20 miles) daily commutes – or who have access to workplace charging (even if the workplace is a college campus or shopping mall) and charge charge mid-commute – can expect stellar results, though. Up to 25 miles at speeds of up to 84 mph. All Primes come standard with Toyota’s Safety Sense-P suite of pre-collision system with pedestrian detection and automatic braking, lane departure alert with steering assist to help nudge you back into your lane, radar-based active cruise control that can safely follow the vehicle ahead right down to a full stop, and automatic high beam adjustment to keep you from inadvertently blinding the drivers of approaching vehicles. …or simple black and white. All Prius Prime models are equipped with Toyota’s aluminum 1.8-liter, 4-cylinder, dual overhead cam engine with intelligent variable valve timing (VVT-i in Toyota’s parlance), coupled to a continuously variable transmission (CVT). In a first for Toyota – the two motor generators in the 2017 Prius Prime are linked via a one-way clutch. That enables Motor-Generator One, used for providing electrical power in the standard hybrid, to help drive the wheels when additional power is needed, as in passing and when operating at speed in all-electric mode. Motor-Generator Two continues to serve as the primary traction motor, driving the front wheels and regenerating energy during braking. The 2017 Prius Prime defaults to an EV-first mode when the battery is sufficiently charged, using battery power as much as possible before switching to hybrid mode. There are two driver selectable modes as well: EV Auto, which adds gasoline power when the central computer decides that would be more efficient (climbing hills, for instance), and Hybrid Mode, which saves battery power by making the gas engine do most of the work, supported by the electric motor. By holding down the EV Mode button for a few seconds, driver’s can force the Prime to use excess engine and regenerative braking power to recharge the battery pack on the fly, increasing the amount of time the systems spends in all-electric drive. In gas-only mode, the Prime’s 1.8-liter engine delivers 95 horsepower and 105 lb.-ft. of torque. Combined gas-electric system horsepower jumps to 121. Toyota doesn’t disclose combined torque figures. The Prime is no race car and is not appreciably quicker than the standard Prius, which takes nearly 10 seconds to hit 60 mph from a standing start. In passing range – 40 to 65 mph – the Prime’s acceleration feels quite adequate, however. The 2017 Prius Prime utilizes an 8.8 kWh, lithium-ion battery pack, of which about 6 kWh is usable in most conditions. The pack is electronically heated to improve cold-weather performance and, at 265 lbs., weighs almost 130 pounds more than the battery pack in the conventional hybrid Prius lift back. The extra weight doesn’t seem to hurt fuel efficiency and it definitely improves handling on curves. The hybrid system, including control modules and the battery pack and power inverter are covered for eight years or 100,000 miles in most states. In states using California emissions standards rather than federal standards, the battery is covered for 10 years or 150,000 miles and other hybrid components are covered for 15 years or 150,000 miles. push-button start; tilt and telescoping steering wheel with integral audio, climate, information display and hands-free phone controls; digital instrumentation including plug-in hybrid system displays; 4.2-inch color info display screen; four-passenger seating with cloth upholstery; 60/40 fold-down rear seats; front and rear padded armrests with cup holders and covered storage; a cargo-area light; a single front USB power outlet and front and rear 12-volt auxiliary power outlets; a charging cable suitable for Level 1 (120-volt) outlets. The Prime Premium adds an auto-on feature for the headlights; a charging cable lock; a leather-like synthetic upholstery material (Toyota calls it SofTex); heated front seats; 8-way power driver seat with power lumbar, 4-way adjustable front passenger seat and remote-activated illuminated entry lights, and wireless charging for Qi-compatible smartphones and other devices. The Prime Advanced adds LED fog lights and accent lights; rain-sensing windshield wipers; remote air conditioning system activation; a color head-up display for speedometer, navigation and hybrid system indicators; a SofTex-trimmed steering wheel; auto dimming rearview mirror; cargo cover; blind sport monitor with rear cross-traffic alert and parking clearance alerts, and parking assist with automatic steering. 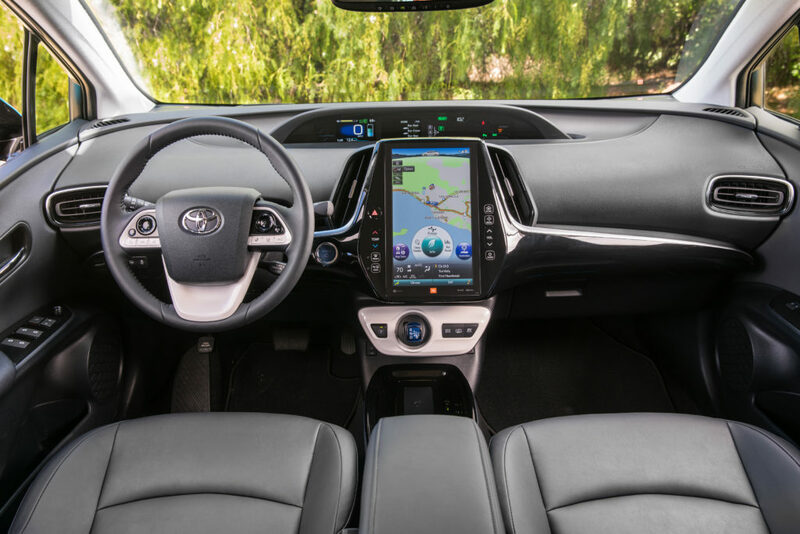 Toyota’s Entune Premium audio with integrated navigation and applications suite, voice recognition and Bluetooth is standard on all trim levels. In the Prime Plus it comes with a 7-inch color touchscreen, six-speaker AM/FM and Sirius XM radio, HD radio, an auxiliary jack and USB power port. The Prime Premium level adds an 11.6-inch color touchscreen – Toyota’s largest; MP3 playback; iPod connectivity and a charging station map. Prime Advanced buyers get a 10-speaker JBL Entune system that adds Prime Apps, including remote charging and climate system management and remote vehicle finder. The 2017 Prius Prime’s battery pack pushes the floor of the cargo area up an inch or so higher than in the standard Prius, but engineers added 4.2 inches to the length of the body, all in the rear, to accommodate the battery and under-seat battery charger. Thus the Prime’s 19.8 cubic feet of cutting cargo capacity is just 15 percent less than in the standard liftback. With the rear seat backs folded down, cargo area nearly doubles. The redesign of the 2016 Prius is polarizing, to say the least. The front end looks like a squashed version of the previous generation’s nose and the back end looks like no one could decide what to do so they stitched together a messy combination of the rear ends sketched by at least three different designers. With the Prime, that’s all been fixed. An aggressive new nose with gaping faux scoops (vortex generators according to Toyota engineers) on either side, a new tail design with horizontal rather than vertical taillights, curved “wave form” back glass with integrated spoiler and an additional 4.2 inches of sheet metal between the rear door and rear bumper cut lines combine to make a world of eye-pleasing difference. An added safety note: The curved back glass is optically correct – it doesn’t distort the driver’s rear view. Inside, the Prime is a near-clone on the standard Prius up front. In the rear though, Toyota engineers and designers wisely decided not to try to pretend there was sufficient back seat room for a center position. They wisely using that space, which would be narrow for a person, to house a roomy, padded arm rest and storage bin. The result is an impressively spacious rear seating compartment. 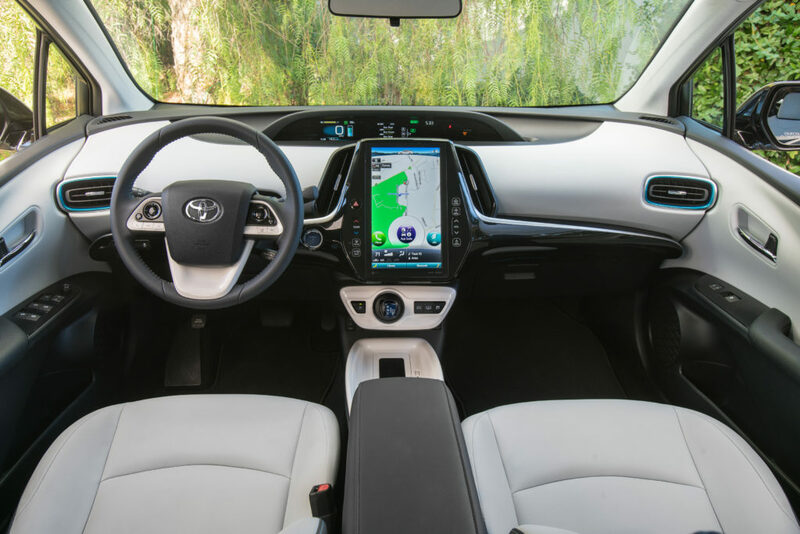 In a recent day-long program that involved almost 150 miles of driving in several 2017 Prius Prime models, TheGreenCarGuy found the latest member of the Prius family to be roomy, with comfortable, supportive seats and an incredible amount of front legroom. Rear seats were roomy and comfortable, although rear headroom could be a bit constrained for the tallest passengers because of the downward slant of the roof line and the liftback’s curvy rear glass. No one buys a Prius to drag race other cars at stop signs. But though blinding acceleration isn’t expected, decent handling and control should be. In Priuses past, that really wasn’t the case. There wasn’t anything wrong, there just wasn’t much there. “Numb” was a word often used to describe steering response and suspension tuning. With the 2017 Prius Prime, as with the redesigned standard Prius on which it is based, the engineers got it right. Steering is fairly crisp and responsive and though the car feels a little floaty up front at speed, the re-tuned rear springs and the weight of the battery perched over the rear wheels helps keep it pinned nicely to the road. On curvy stretches of road the 2017 Prius Prime takes a nice set on its double wishbone rear suspension and pulls through with nary a complaint. It’s difficult, unless you are really busting the speed limit, to break the tires loose. 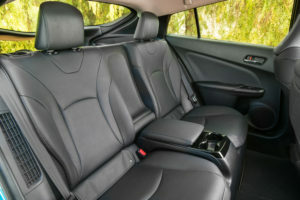 The ride is biased just a bit toward comfort over firmness, but that’s not something that will bother many Prius owners. 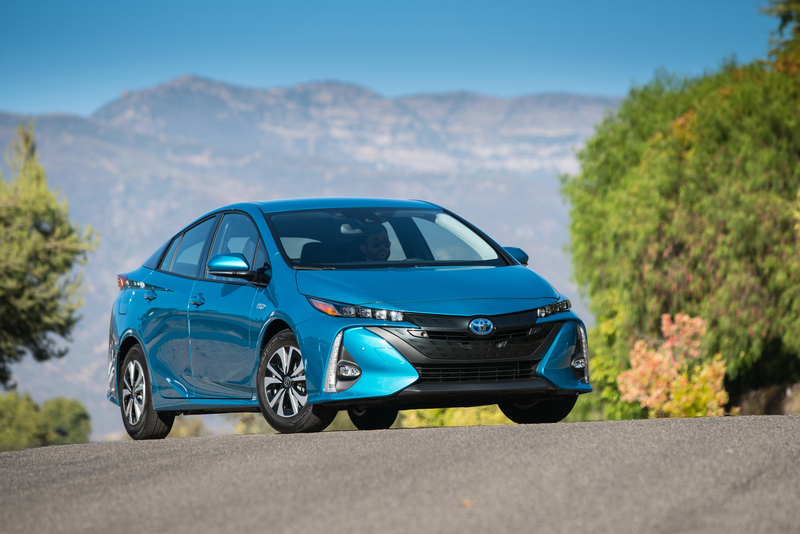 Braking is smooth and while acceleration from a standing start is as pokey as in the standard hybrid version, the electric drive assist gives the Prius Prime perfectly adequate passing acceleration in the 40 to 70 mpg range. Wind and road noise, except for the hum of the low rolling resistance tires, was almost imperceptible. We haven’t had a really long drive yet, so can’t comment on how one feels climbing out of the Prime after a long day of travel. But in our time with the car, in both cloth- and SofTex-upholstered versions, we had no complaints about seat fit, support or comfort. Photos courtesy of Toyota Motor Sales USA. To prepare this report, TheGreenCarGuy attended a media event for which Toyota provided transportation, meals and housing.